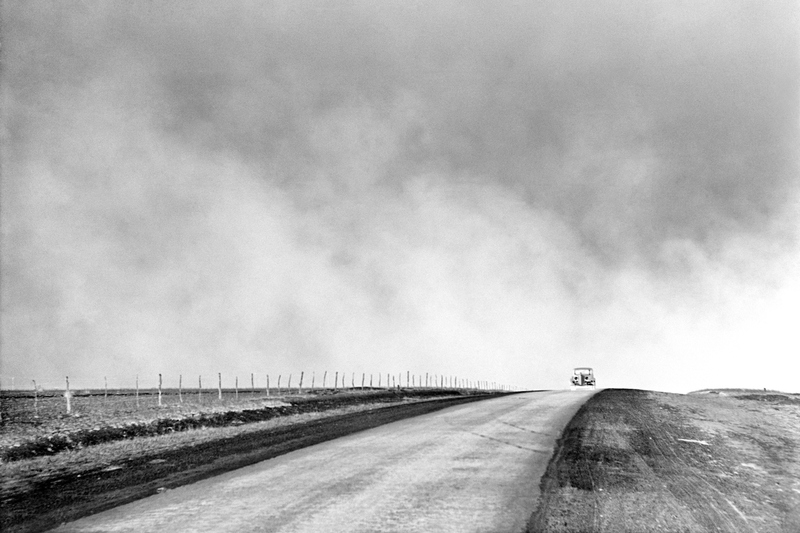 Eighty-five years ago today, on November 11, 1933, an especially powerful dust storm hit South Dakota, stripping topsoil from desiccated farmlands. It was one of a series of notorious dust storms that year, part of what would come to be known as the Dust Bowl, or “Dirty Thirties,” a period that began in 1930 and would last for the entire decade. Many Americans are familiar with elements of this traumatic historical period, thanks to John Steinbeck’s Grapes of Wrath, but few know that it was one of the worst ecological disasters in American history. Fewer still know that the Dust Bowl offers an unparalleled case study into how a group of independent, government-skeptical Americans came to see the need for federal assistance. Surprisingly, the US government provided much of the assistance that preserved both the American prairielands and the livelihoods of those who called the prairielands home. The origins of the Dust Bowl begin during World War I and continue into the “Roaring Twenties.” The decade’s booming economy benefited not only Great Gatsby-style businessmen, but also farmers across the Great Plains. The war in Europe created a significant demand for American agricultural products. Farmers on the plains responded by extensive plowing of virgin topsoil across the prairielands. Lacking knowledge of the stability of the plains ecosystem—which was preserved by native, deep-rooted grasses that trapped soil and moisture—the farmers plowed the soil very deeply. They were aided by the rapid mechanization of farm equipment, such as small gasoline tractors and combine harvesters. Millions of acres of land in South Dakota, Nebraska, Texas, Kansas, Oklahoma, Colorado, and New Mexico were converted from arid grassland to cultivated cropland. When the Great Depression hit, desperate farmers plowed even more earth to try to maintain their incomes. This placed even more strain on already fragile land, much of which received no more than ten inches of precipitation a year. The farmers’ way of life was then upended with a drought, which began in 1931. The drought caused erosion and loss of topsoil, reducing the soil to a powder-like consistency. With much of the indigenous grasses gone, high winds picked up the topsoil and created dust storms, the likes of which no one had seen before. Ken Burns’s 2012 documentary on the Dust Bowl offers remarkable footage of these storms, which overtook the landscape in what many eye-witnesses claimed felt like the apocalypse. The storms could blacken the entire sky. Witnesses often noted that their visibility was reduced to a mere few feet on some days. A two-day dust storm on May 9, 1934—one of the worst of the entire decade—blew dust almost a thousand miles to Chicago, depositing twelve million pounds of dust on the Windy City. Two days later, that same storm hit Cleveland, Buffalo, Boston, and New York City. Red snow—another effect of the Dust Bowl—fell on New England in the winter of 1934–1935. The following year, on April 14, 1935, twenty of the worst storms, or “black blizzards,” occurred, causing the day to become known as “Black Sunday” across the country. At one point, the dust blew through Washington, DC, and landed on the White House desk of President Franklin Delano Roosevelt (FDR). The crisis caused a remarkable paradigm shift in politics. Entrepreneurs known as “suitcase farmers”—investors from outside the plains who bought large tracts of land to enjoy the agricultural boom of the 1920s—aggravated the problem by abandoning hundreds of thousands of acres of exposed land. Farmers, themselves rigidly independent and suspicious of government, felt betrayed by these capitalist carpetbaggers. Alternatively, plains farmers—described by historian Donald Worster as “a group of people who are very anti-state, anti-government, who never wanted the government interfering in anything they did”—began petitioning the federal government for assistance. Some sought civil permission to condemn other people’s property if they weren’t keeping it up—a “very authoritarian measure for folks who consider themselves highly individualistic,” observes journalist Timothy Egan. Others would later propose martial law across the plains. “It has to be pretty extreme for a group of farmers, very independent-minded, very stubborn, a group that on the whole doesn’t like to be meddled with, to ask ‘please come and meddle with us,’” notes historian Pamela Riney-Kehrberg. Historically Republican-leaning counties across the prairies voted for FDR in the 1932 presidential election in the hopes of securing relief. The newly-elected president responded to their cries for help within his first one hundred days in office. He relied extensively on Hugh Hammond Bennett, a North Carolina soil expert, and Secretary of Agriculture Henry Wallace, who believed better farming practices would alleviate the storms. Under the supervision of Bennett, the United States Forestry Service’s Prairie States Forestry Project planted trees on private lands to create shelterbelts to reduce erosion. To arrest further soil deterioration, the Taylor Grazing Act took 140 million acres out of the public domain and established carefully monitored grazing districts. The Drought Relief Service coordinated relief activities, including buying cattle from impoverished farmers and selling them to hungry Americans. The Works Progress Administration (WPA)—which employed 8.5 million Americans—offered job opportunities to desperate farmers. Federal employees traveled the Plains, teaching farmers better farming methods. Historians debate the effectiveness of all these programs. They even debate the degree to which the “Great Plow-up” of the decades preceding the 1930s was the cause of the Dust Bowl. What is not debated is that the over-farming of the Plains contributed to the dust storms, and that the programs initiated by the FDR administration provided significant relief to many desperate American farmers. There’s a reason so many previously libertarian-leaning farmers became Democrats in the 1930s. Sadly, many Americans—especially Los Angeles Police Chief James E. Davis, who sent policemen to patrol the southern border of California to keep “undesirables” out of his state—had little interest in helping the people of the Great Plains. Some shrugged their shoulders over a mess they believed the farmers had themselves created. Yet Roosevelt’s administration recognized that the common good of the entire country was threatened by the disaster across the Plains. FDR’s overarching objective was not to drive the farmers from their homes or overthrow their way of life, but to help them conserve it through better agricultural practices that honored the land and enabled them to preserve a valued American subculture. By 1938, the extensive re-plowing of the land into furrows, planting trees in shelterbelts, and other conservation methods resulted in a sixty-five percent reduction in the amount of soil blowing. The next year, the drought finally ended. With the beginning of World War II, the Great Depression came to a close, and the Great Plains once again became covered in golden wheat for the war effort. This is not to say that the problem was resolved; there were severe dust storms again in the 1940s and 1950s. Furthermore, a second Dust Bowl is still very possible, given that US agribusiness is draining the groundwater from the Ogallala Aquifer—the prime source of water for the Great Plains—eight times faster than it is replenished by rain. US agribusiness is a $20-billion-a-year industry that grows almost one-fifth of the United States’ wheat, corn, and beef cattle. Moreover, US farmers are now very heavily regulated, controlled by quotas, and, in many cases, sustained by subsidies. In many cases, the federal government has become the farmer’s senior partner—a most unhealthy economic paradigm. For reasons such as these, Americans should pause and consider the long-term viability of the current way of life on the plains. Many popular accounts of the Dust Bowl focus on the alleged greed or short-sightedness of the farmers of the plains. Perhaps there is some merit to that narrative, though it seems many were simply oblivious to the ecological chaos they caused. Many at the time believed, wrongly, the aphorism “rain follows the plow.” A far more interesting, far less popular narrative is how staunchly self-reliant American farmers who eschewed federal intervention and desired to be left alone encountered a crisis they simply could not overcome on their own. For those who stayed, programs like the Soil Conservation Service, Drought Relief Service, WPA, and Civilian Conservation Corps often provided the necessary financial relief, technical guidance, and employment opportunities to save many families from poverty or death. The story of the Dust Bowl is a story about American grit and perseverance, but also about the limits of libertarianism.